I will be exhibiting a piece of work in this exhibition between 26th February – 3rd March. 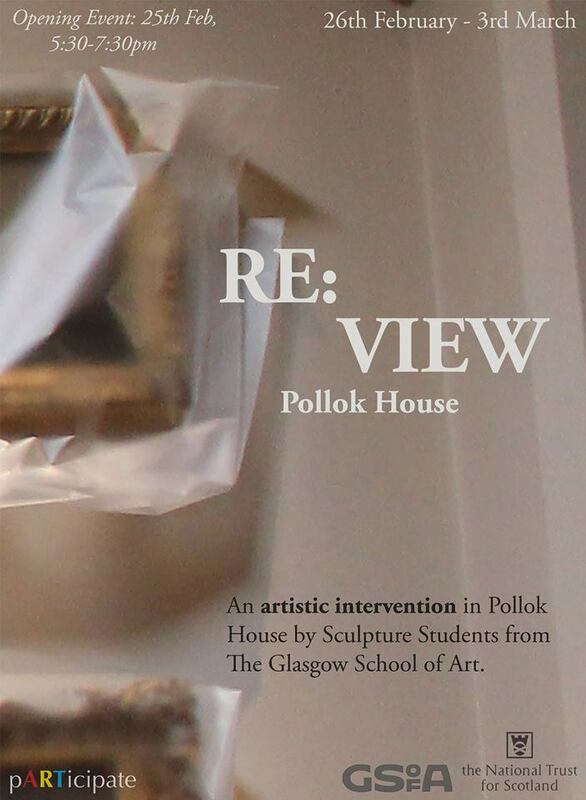 RE:VIEW is an intervention into Pollok House by undergraduate and postgraduate students from the Department of Sculpture & Environmental Art at Glasgow School of Art. 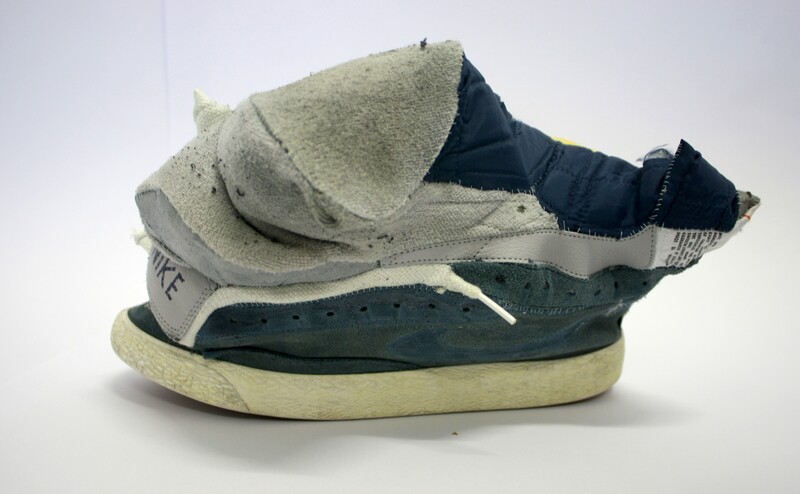 Through sculpture, installation and performance, the nine exhibiting artists explore such themes as critical museology, domestic labour and privilege, materiality and the movement of information. With each intervention made especially for Pollok House, RE:VIEW provides a dynamic counterpoint to its historical collection and contemporary activities. The exhibiting artists are Honey Jones-Hughes, MollyMae Whawell, Natalie Rose Clarke, Kate O’Shea, Shu Xin, Martin Darbyshire, Stefano Pia, Nathan Smith and Tara Marshall-Tierney. The opening event takes place on Thursday 25th February from 5.30 – 7.30pm and is open to all, refreshments will be served. The exhibition runs from 26th February to 3rd March, open 10am – 5pm every day. Entry to the exhibition and to the House itself is free. The artists will all be present at the preview event so there will be an opportunity to ask them about their work, although there are no scheduled artists’ talks. The culmination of my recent research into divination has been a book titled Calixtheamancy: A Practical Guide. Alongside this I have been developing a performance piece which will take place at a two-day exhibition staged in the Savoy Centre in Glasgow city centre. The piece, Calixtheamancy, is a participative work based on the idea of fortune telling and alternative methods of divination. Participants will have the opportunity to have their fortune read through an entirely new method of divination, devised by me. 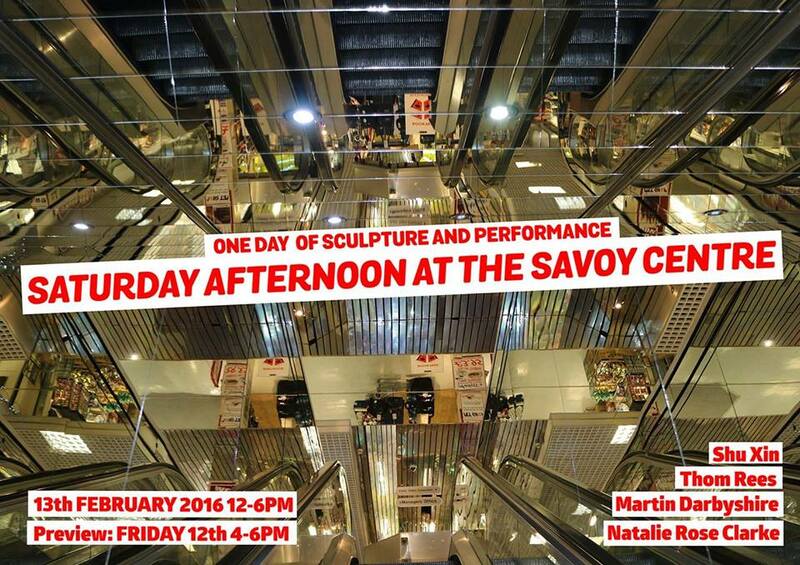 The performance will take place in unit 64, first floor of the Savoy Centre at 4.30-5.30pm on Friday 12th February. More information about the exhibition can be found here. I’m pleased to announce that one of my pieces has been selected for an exhibition at York St. Mary’s this Autumn. ‘Value of the Find’ is a pop-up exhibition running alongside the main exhibition, ‘Finding the Value’. The piece on show will be Teratoma. Teratoma is part of a series of recent works investigating the idea of ‘non-functional functional objects’ – the idea being that if one removes an item’s purpose, it becomes an object of interest in itself. The word ‘teratoma’ refers to a specific type of tumour in which the growth encases fully-formed body parts: hair, teeth and even eyes. This piece explores the sense of absence/presence that is inherent in clothing – a shoe is essentially incomplete without a foot. The exhibition runs from 24th October to 2nd November and features work from a number of British artists. My most recent sculpture, Food Series II, was exhibited in Pamplemousse, an exhibition of fine art graduates’ work, between 15th – 31st May this year. More images of the piece can be found on the sculpture page of my website. Below are a few images and a description of the motivations of the work and its place within my practice. For something to feel right it must first be made to feel wrong. Using a process that ‘feels right’ to create something that ‘feels wrong’ (making the familiar unfamiliar, the functional non-functional and the comforting disconcerting) in turn creates a piece of art that ‘feels right’ by way of feeling wrong. My work is essentially process-led. From month to month, I will become preoccupied by a certain process or activity, and will solely create works that involve this method – wrapping, folding, sewing, baking – until I feel the process has been fully resolved, and will then move on to whichever process next catches my interest. Because of this, my work tends to be very labour-intensive – something which I think is inevitable with such a process-based practice. Over the past year, my work has questioned the concepts of functionality, familiarity and comfort through this framework of process-to-product. The advantage of this way of working is that by not being tied to a specific visual concept of a piece, I can work intuitively, allowing me to make decisions that ‘feel right’ rather than having to stick to preconceived guidelines. The most important theme that drives my work is one of incongruity; the notion of creating something that is simultaneously comforting and repelling: a work of art that draws the viewer in and then turns the scene they are expecting on its head. This work inhabits the dichotomy of a non-functional functional object, something that I have been interested in, in different guises, for a long time. By taking away the main function of an object, it’s as if the viewer is seeing it for the first time: they are led to consider it as a standalone, away from its place in the structure of our everyday lives. When considering this with regards to Food Series II, the importance of process to the work becomes absurd almost to the point of insanity: what kind of person would spend weeks making hundreds of loaves of bread that by their very nature are totally inedible? This question – ‘what kind of person would do that?’ – touches on two issues of women’s identity that inform the piece. At first glance the work offers a tongue-in-cheek response to the traditional domestic pressures that constrain women’s creativity and independence summed up in the phrase ‘a woman’s place is in the kitchen’. 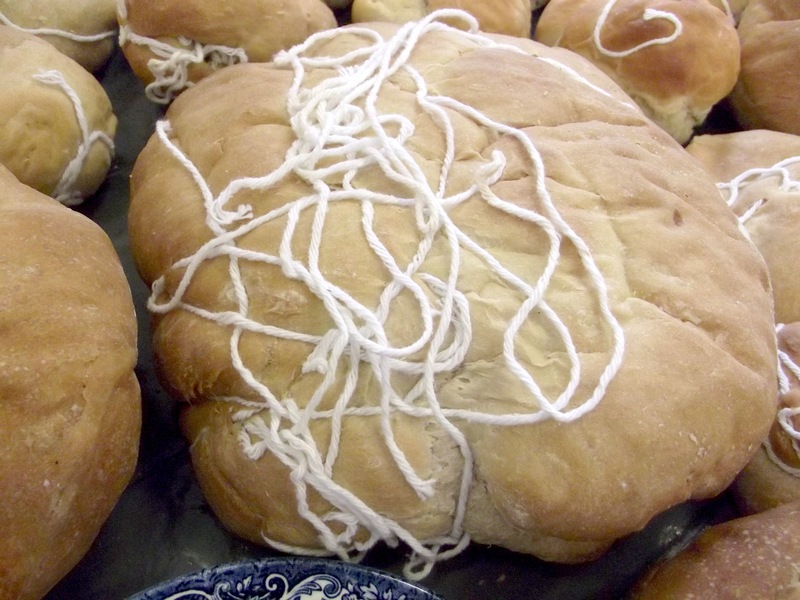 On the other hand, when taking into account the recurrent theme of reminiscence that runs through my practice – something influenced by my work as a carer for my gran and other elderly people – it could be seen to reference something else entirely; the relentless repetitive labour that is so often characterises dementia – the bread is made, and yet, in the maker’s damaged memory, there is uncertainty: is the bread made? Some stylistic decisions that I had considered integral to my earlier works have been left behind or altered in Food Series, which I think is inevitable to a certain degree when dealing with such a drastic change in materials. When entering into the dialogue of craft techniques in a fine art setting, it is very important to know where you stand in it, which for me meant emphasising the point that the work is fine art rather than craft – so I made sure to use crisp, clean lines and a limited colour palette. In Food Series, as my work moved away from craft techniques and the importance of the material’s natural shape grew, this became less important. Provoking feelings of unease in the viewer was also a key consideration in much of my earlier work that has manifested itself in a different way in this piece – the subtlety of the string in the bread means that it takes the brain just that bit longer to process what’s ‘off’ with the items in front of it, letting the viewer absorb the scene in two ways in quick succession. I was drawn to the idea of using bread as a material for a number of reasons. Firstly the familiarity of it; bread is such a ubiquitous food, recognisable to almost everyone on the planet, and concepts of familiarity, comfort and reminiscence are central to my work. Secondly, the ancient nature of it; I find it fascinating that the ingredients and method that I use to make bread today are almost identical to those used by my ancestors thousands of years ago. Thirdly, the materiality of it; the taste, texture and smell of bread are totally unique, and all are powerful in terms of reminiscence. Lastly, the idea of the chemical reaction that enables us to turn three simple ingredients – flour, yeast and water – into bread. In my mind, these 4 ideas are intrinsically linked as part of the process of life: the ancient nature of bread means that it is immediately recognisable, and sparks memories in all of us, whilst we have harnessed the power of a living organism to create this food that keeps us alive. Working with a material so strongly linked with humanity means entering into a dialogue about the absence/presence of the human body in the work – the material that is so essential to our lives is removed from its true purpose and thus loses its connection to its makers, but at the same time, by its nature can never realistically be entirely disconnected. The alien materials I introduced to the bread are chosen for two different reasons. The blue willow-patterned plates I chose for their ability to inspire reminiscence: I inherited these plates from my grandma, and the response the piece got from audience members was frequently along those lines – “My nanna had those plates”, “my gran gave me a set of those plates when I moved away from home”. The string has a dual purpose: alongside the plates, it is intended to direct the kind of reminiscences the viewer experiences, evoking images of crafts – knitting, crochet – that most would associate with a grandma. Its main purpose, however, is as a way of conveying the sense of unease that is integral to this work: the viewer is enticed by an array of foodstuffs, but on imagining the feel of the bread in their mouth they are confronted with the nauseating texture of cotton yarn and thread. The sensory element of this piece is central to its intent; smell is arguably the most important sense in terms of memory, and is a powerful tool in provoking reminiscence, so I was keen to include this in my work. 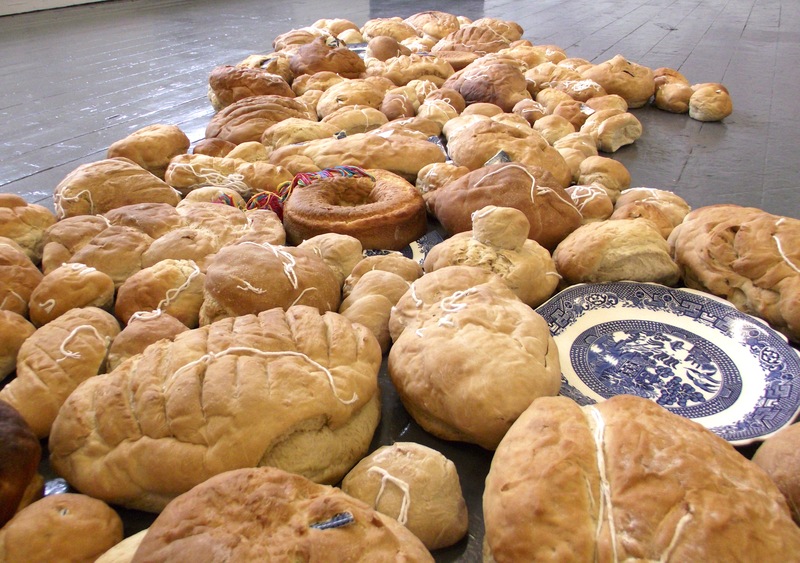 The audience reaction to the scent of the piece has been overwhelmingly positive – food smells are very evocative for most people – and a number of them have commented not only on the memories that the smell provoked, but the incongruity of the ‘homely, comforting’ smell of fresh bread in a gallery setting. My concentration on chemical reactions in art stems from a longstanding interest in works of art where one or more factors are determined by chance. The idea of relinquishing control of certain aspects of a piece is at once both daunting and liberating to me as the artist; and seems to make a compelling piece for the viewer: when no two components of the mosaic are exactly the same, there are endless ways to explore the work, and numerous conclusions to be drawn from the configuration. The dough expands as it proves, and then expands again in the heat of the oven, forming itself around the incongruous materials that have become part of its structure through the repetitive process of kneading, folding and shaping. Over the past 3 months I’ve been leading a series of workshops in schools as part of a celebration of British choral music. The workshops focused on letting the children visually interpret the choral works we played them via a range of materials. The culmination of these workshops was an exhibition of the children’s work on the festival weekend of Britain in Song. 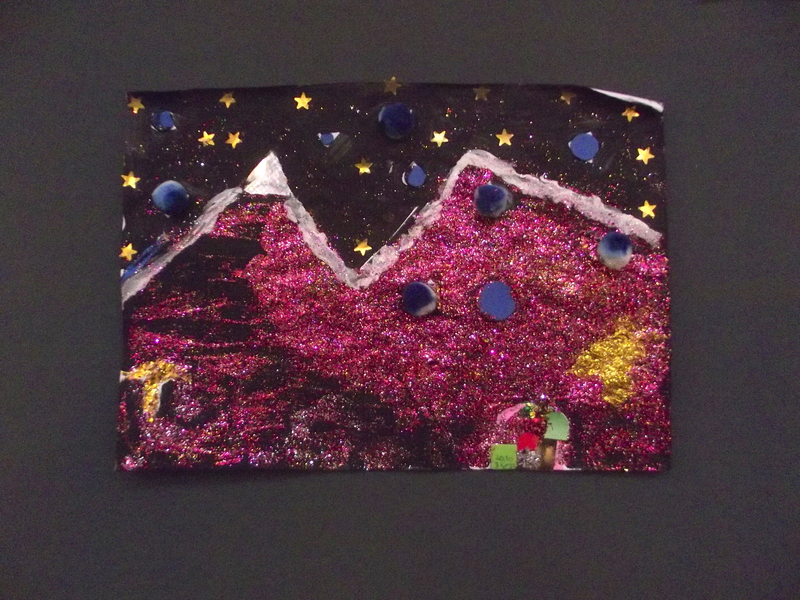 In addition to the children’s collages, there were a number of works on display by local artists, including myself. All the work was exhibited in the atrium of the Ron Cooke Hub at the University of York, alongside a video installation and a dance piece inspired by the music. The painting shown above is the piece I entered for the exhibition – called Distinguishing Features, it’s a response to 17 Days by James McCarthy, a choral work that tells the story of the Chilean mining disaster of 2010. Whilst researching the piece and the disaster, I came across a series of mugshot-style photographs that were published by the BBC in the days following the rescue, which depicted the miners in the order they had come out of the mine. These photos formed the basis of the painting, with the hair and facial outlines of the miners being marked out in glue underneath the paint. All works of art on this site are for sale unless otherwise stated. To register an interest, please use the contact form.